Hours: M - F 9:00 a.m. to 5:00 p.m.
1 James J. Eagan Dr.
For additional information please call (314) 921-5678 24 hours a day. Visa, Mastercard and Discover are accepted. Individual tickets go on sale 45 days prior to the opening of any production. !! 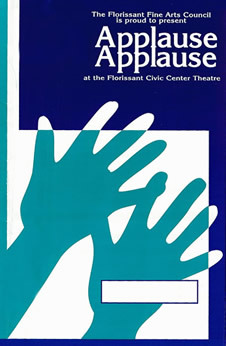 !NEW STUDENT RATE FOR ALL APPLAUSE APPLAUSE SERIES SHOWS!!! THE FLORISSANT CIVIC CENTER OFFERS LISTENING ASSISTED DEVICES UPON REQUEST AT THE BOX OFFICE. WE ARE ADA ACCESSIBLE. The year 2019 will mark the 100th anniversary of the birth of Nat King Cole. An incandescent voice…Unforgettable in every way! If you close your eyes and let the soft, elegant music envelope you, it will be as though Nat King Cole himself has stepped up to the microphone when Joe Bourne claims the music. Joe Bourne has been winning over music fans for years with his smooth, soft baritone voice, perfectly emulating the legendary Nat King Cole with the same quiet dignity, style, and sophistication. An Unforgettable Century is accompanied by Joe’s trio consisting of Nat’s original sound - piano, bass and guitar - using arrangements transcribed from the original recordings, and is accompanied by an evocative, educational narration. Presented are swinging and sophisticated arrangements of songs like: Orange Colored Sky, Walking My Baby Back Home, Paper Moon, Sweet Lorraine, Mona Lisa, Nature Boy, When I Fall In Love, Route 66, Unforgettable and many more. Journey through the history of the American musical with the area’s top theatre musicians featuring Charles Glenn and Patricia Scanlon! This unique orchestra joins our series in cooperation with the American Federation of Musicians Local 2-197 to bring audiences the brightest moments in Broadway history from the inception of musicals to the current day. The son of an accomplished opera singer, Charles received early musical training in both voice and percussion. Charles has utilized both his strong vocal and percussion talents as the opening act for such national groups as Smokey Robinson, Huey Lewis and the News, and the Allman Brothers. Charles can often be seen and heard singing the National Anthem for the St. Louis Blues home games. Patricia has been a soloist, cover soprano, and section leader for 14 years with the St. Louis Symphony Chorus. She is also a soloist with the St. Louis Theatre Musicians Orchestra since 2003 and has worked extensively with the Florissant Northwinds Concert Band and the Hawthorne Players of Florissant. James J. Eagan Center located at the corner of Parker Rd. and Waterford Dr.